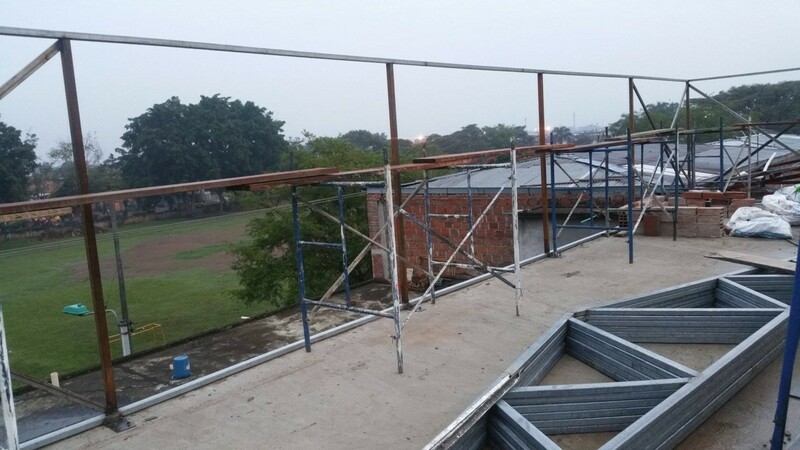 Kids Foundation – on schedule! 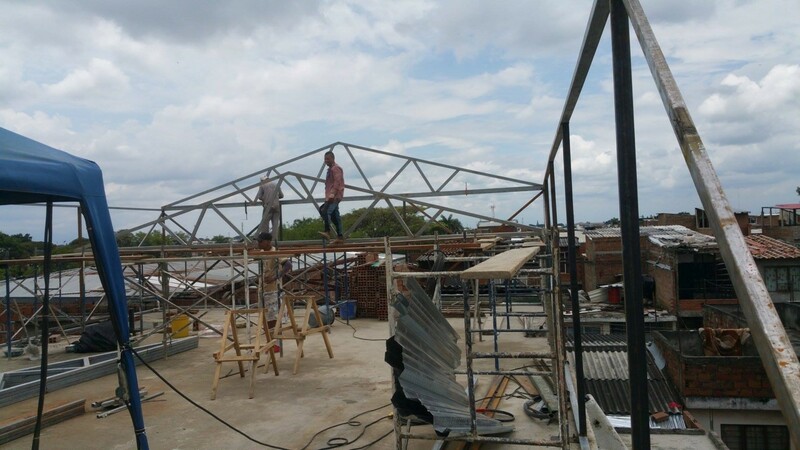 A good day for Thanney today, and his band of brothers – apart from one rin altercation that took out 2 hours work time, the construction is on schedule to be where Thanney wants it to be for the end of this trip. He really has worked his socks off, and has achieved something that, a week ago, he wasn’t so sure would happen. 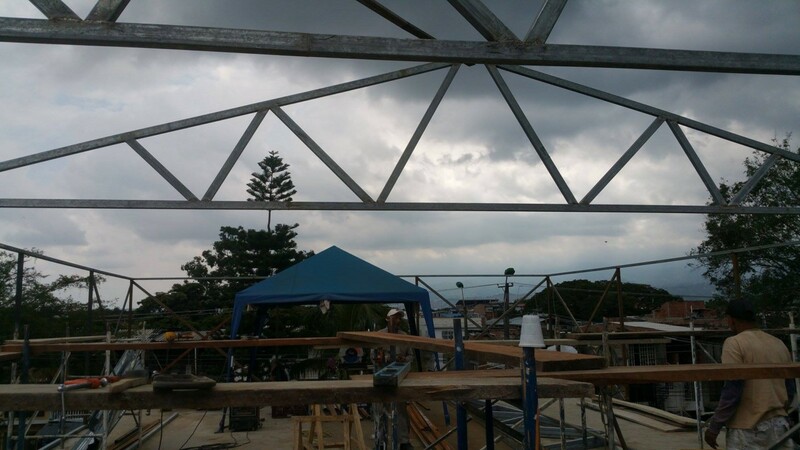 Today four trusses were erected – 2 to go tomorrow, and some work, that Thanney will leave for the local guys to do in his absence, before July, will – God willing! – get done by them. The rain didn’t quite obey today – it threw it down unbelieveably hard for 2 hours – electricity went off everywhere, it seems, including in our apartment, so what has been achieved today is nothing short of miraculous. So much steel…. pictures here to show those of you who might understand what it’s all about, and to impress people like me, who have no idea what it all does, except that I’m glad it does it, and buildings I go into stay up! COPesos 14,500,000. That’s in the ‘bank’ for the next time: for which the budget increases anyway – should have been £15,000 this time, next tie I believe it’s £22,000. 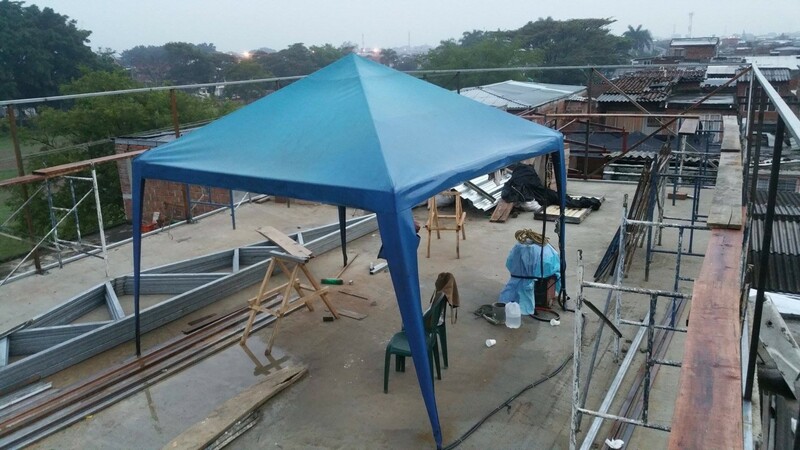 All the extra kids that can be accommodated make that a small price to pray…..
Thanney’s worked wonders – not only on the roof, but also with the guys who’ve been assisting him: they have a new found work-ethic that hey might not have had before. Knees up Mr B! 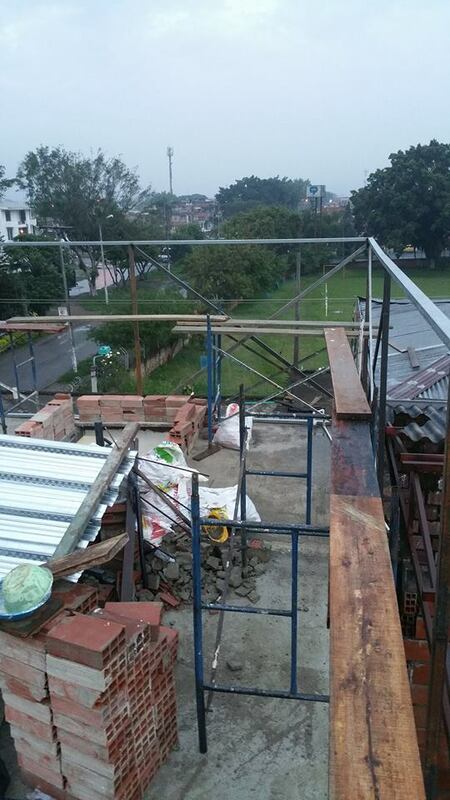 Miracle update…..
Just a progress report for anyone interested…. 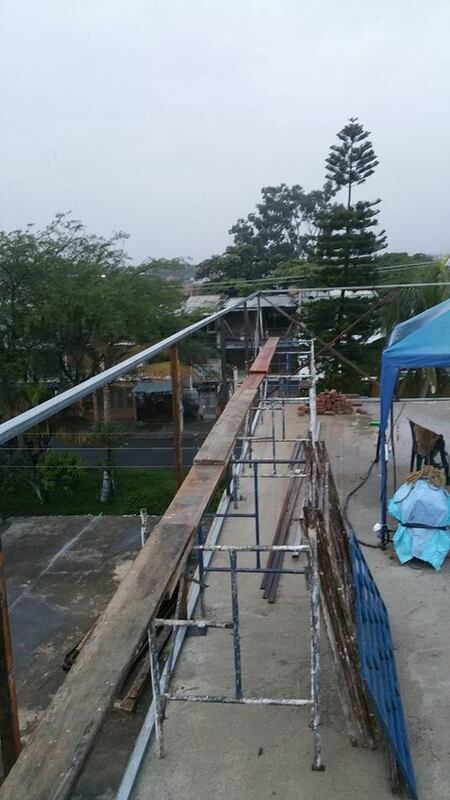 last night, at the church ‘El Vive’, they meet upstairs (not the esiest of stairs, either 😉 ) – a fact that would have, not so long ago, had a bearing on my preaching somewhere or not…. last night, Wilmar was shocked! I think I was, too: I went fast… like ‘normal’ people go upstairs, not both feet on the same stair and a long pause to let the pain go down on each one…. and standing, preaching, only leaning occasionally on the reading stand, rather than supporting myself on it for the duration…. Look at my fancy knees…. Yes, there’s soreness, but the muscles, ligaments, tendons – you name them! – haven’t really been used for a decade or more, as they were designed to be used: yes, there’s some discomfort – but NOW, that’s mostly from my feet, which have changed ‘shape’ considerably the past 16 years – flattened (no arches), my shins (I look like John Wayne’s just got off his horse after 30 years in the saddle!) which are bowed….so some straightening up to be done by the living Lord Jesus, new arches… but it’s incredible being able to walk, SUCH a miracle. As the muscles get stronger, less inflamed, the feet straightened, and the horse I’ve been ‘riding'(!) consigned to history, it’ll get better and better. The ‘breathlessness’ that comes with struggling to walk under duress, is going: along with the sweating that often produces…. THANK YOU, all of you who have faithfully prayed for me, for many years. You have no idea what your prayers mean to me: please don’t stop! – I’d love these feet, and shins/calves, to be ‘normalised’ too, it’s still part of the miracle. All I can say is that your prayers are BEING answered big-time, and the ‘double-whammy’ blessing of finding almost a new place of affirmation and honour here in Cali, has totally and utterly blown me away. My passion for this city increases with every visit, and while home will be nice from Tuesday night, back in Bangor, I know I’m leaving an even bigger part of my heart here than ever before, as this trip – you can imagine – has a significance for me like no other, personally….. July, and back here, can’t come soon enough. Those who I’ve talked to, and who have talked to me, about coming here this year, if you haven’t confirmed or otherwise yet, could you do that pretty soon, please? Especially for July…as accommodation needs to be booked: and the October/November trip currently has 12 people confirmed and/or nearly confirmed….. If last night’s report from the church doesn’t make you want to be here – with everyone healed, or well on the way, I don’t know what will! Can’t imagine what you’re looking for from God if that isn’t enough….for now!!! El Vive – He Lives! Miracles at the double…. It’s wonderful to go to a church with yet another ‘alive’ name – HE LIVES – and go, knowing that the Pastor is excited to see you to tell you of miracles that happened there on the last visit, 2½ years earlier…. It’s a church that opens onto a shopping area, and right beside – literally! – one of the busiest roads in the city (Autopista Simon Bolivar). Maybe the ‘prophetic statement’ that church names are is part of why God does so much here, in Africa, in India, and more….? Dario was in a top clinic here in November 2014, having had a major burst of a stomach ulcer. Extreme vomiting of blood, the doctors said that he was beyond help, and would be comatose permanently, or die. I remember the moment well, hearing words come out of my mouth saying that ‘you’ll go home tomorrow, Dario’….. he did. The doctors couldn’t believe it, expecting when he did go home, it would be in a coma, preparing to die. At the same time, in the same hospital, though we weren’t allowed to see him, was Dario and Liliana’s son: suffering from acute Dengue fever, also touch and go if he lived. Prayed for him from next to dad’s bed, and he went home the next day, too…. And so to last night: some of the fastest, rapid-turnover miracles Wilmar – or I, come to that! – have ever seen! First up was a young mum, with her 6 week old son. The little boy had major kidney issues, and couldn’t pee: turns out mum had the same problem. Mum felt the Holy Spirit all over her kidneys, heat in them – no, she didn’t pee on the spot (!! – though I’ve had that happen before, with someone peeing all over my feet!) and the little boy suddenly became active, and crying…. my belief is that he was experiencing exactly what mum was feeling, and I was praying for an extremely wet nappy/diaper by the time she got home…. A lady with osteoarthritis, in great pain, especially knees: was, within 2 minutes, walking across the church, no sign of difficulty, and totally pain-free. Then Andres, a young man involved in a horrendous car crash, in Spain in 2015. He was in a coma for 45 days, major head trauma, totally smashed left hip, blind in his right eye. The car driver, his friend, was killed outright. I always pray against trauma and shock in accident situations, as those things are used as entry points for the enemy to lock you up crippled, and in memory of the tragedy. Wilmar had his hand on Andres’ left hip, in which he never experienced LESS than 9 out of 10 pain. As prayed, Wilmar felt his hip moving inside, straightening, and within a couple of minutes, Andres was TOTALLY pain-free, and he felt ‘burning’ behind his eye….. the sight didn’t come back instantly, but as Jesus never ‘part-healed’ anyone, and the fire of the Holy Spirit was there, it will – I’m praying, it’ll be today…. Another lady with osteoarthritis, head to foot, but especially knees again, was instantly pain-free, and walking – what’ more, squatting, which she hadn’t been able to do for years. Two ladies with kidney problems, one scheduled for fairly imminent surgery, had a ll their pain, ache, and discomfort go. A young lady with acute spinal pain, affecting her sciatic nerve too, and causing extreme leg pain, was due to have major spinal surgery. Her face, as the pain went, was wonderful – tears and smiles all at one (I ought to take out sponsorship with Kleenex, the number of tissues I get through for other people!!). She’d got two impacted and fused discs, damaged vertebrae, and couldn’t bend. 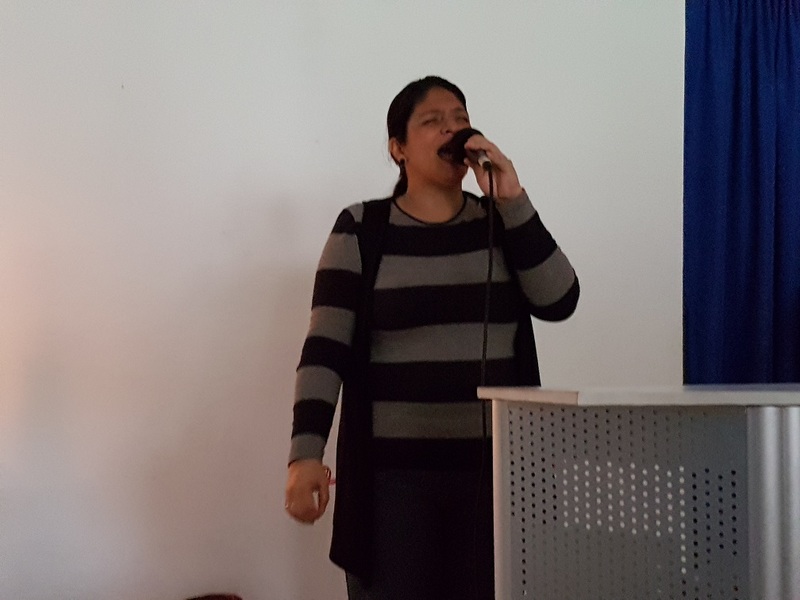 he bent straight afterwards…..
Jennifer, a young lady with gastritis for some time, couldn’t eat, found drinking difficult, suddenly found her tummy on ‘fire’, and the peace of God all over her and her digestive system. And on it went…. 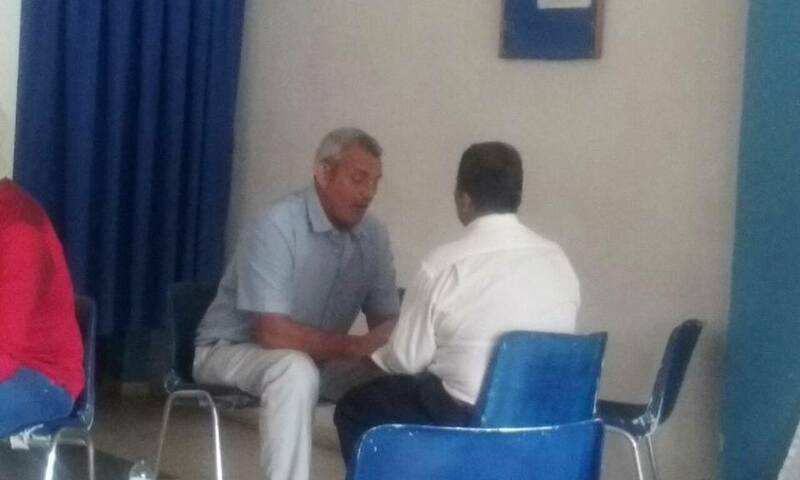 I think most people in the church came for prayer, and, no exaggeration – Wilmar and the Pastors would confirm – everyone was healed, or well in process…. wonderful, wonderful God! Right at the end, Liliana, Dario’s wife asked for prayer: major pain BEHIND her left knee, and x-rays had shown cysts on the ligaments and hamstring, which were going to need surgery. The pain went, and the leg moved normally, freely, and pain-free…. It’s 30 months since I was at ‘El Vive’ – another ‘sign’ that God’s doing something special for me here, is that they want me back in July…. 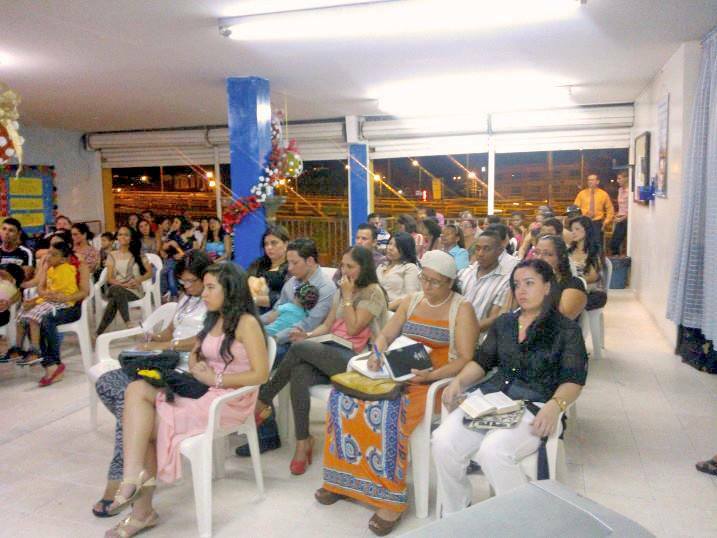 like Alcides, from Sunday, and a few other pastors, too…. often, because of the sheer numbers of churches in this wonderful city, sometimes I don’t get to go back to a church for years – like that of Alcides – first time was 2008, then 2014, then March 2017 – and possibly July 2017! There are some churches I ASK specifically to go to where there are wonderful relationships, but it’s not always possible to fit them in…. Kid’s refuge and rescue foundation – update: Thanney Pyper, the determined work-horse! 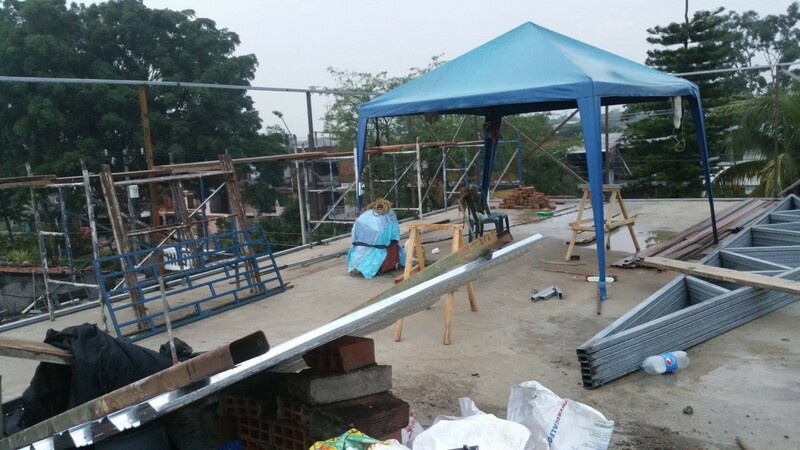 It’s been quiet here on the blog for a few days about the building project, not because nothing’s happening, but you probably might not want to read that lots more steel arrived, was cut up, and welded…. or, perhaps, should have been, a little bit more than it has! Thanney has been a little short of ‘skilled’ local manpower to assist him, and so he’s worked in over-drive to try and keep this trip’s schedule for the construction on course. It’s been hampered, too, by ‘waterfall-like’ rainfall – Andean rain is something to behold (it’s causing many social problems in the mountain communities, with mudslides and so on). 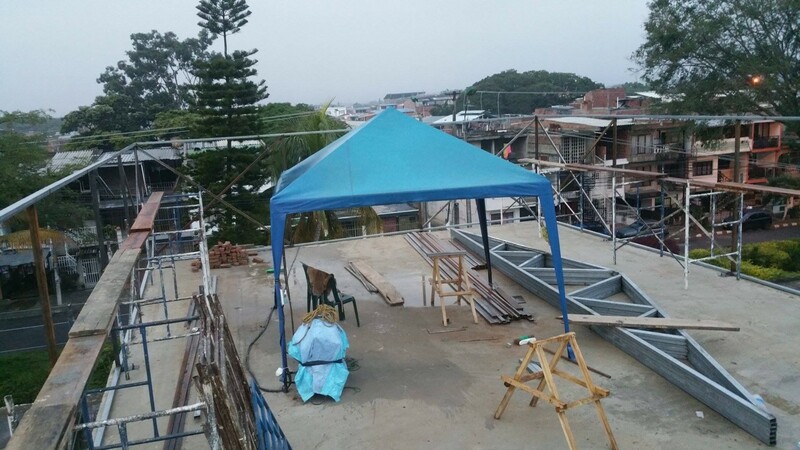 When it’s not raining, it’s often 35°C – and up on an exposed roof, that translates into a ‘body-feel’ temperature of over 40°C – and, because of the rain, too, it’s massively humid (mucho calor!!). Today, Wednesday, COULD – please pray! 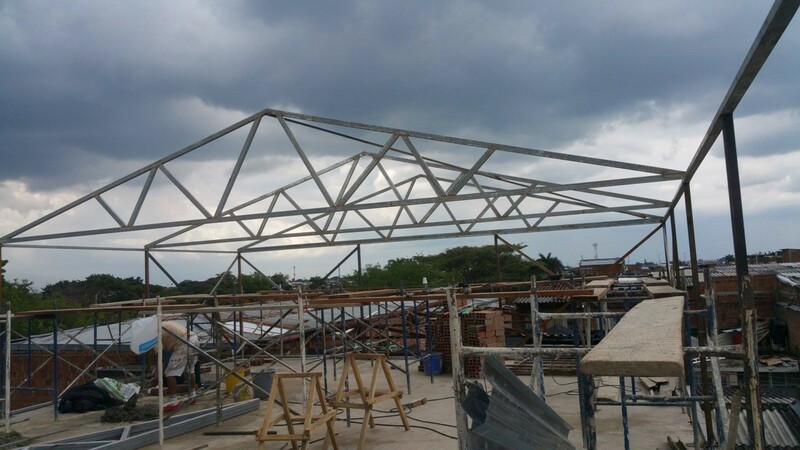 – see the first truss go up: a major breakthrough, as it will mean that it’s possible/probable that the roof can go on by Friday…. Thanney truly HAS worked his fingers to the bone, arriving home black from steel dust and tanned from the temperature – so black and brown together means, until the shower, he looks like a walking bruise 😉 !! We’ve been hampered somewhat, too, by the (understandable) need for clearance in paperwork back in the UK, to get a quite substantial donation for the work through. It is vital that the necessary clearances from HMRC etc., are approved before money comes here – so it’s known it’s not being laundered for other purposes!! Between us, we’ve tried to cover what’s been needed, but have nowhere near enough personal resources for it all, but God seems to have stretched money to the extent that Thanney’s got by without that specific gift….. it MAY come through in the next day or so, but it’ll be for the July trip here then. 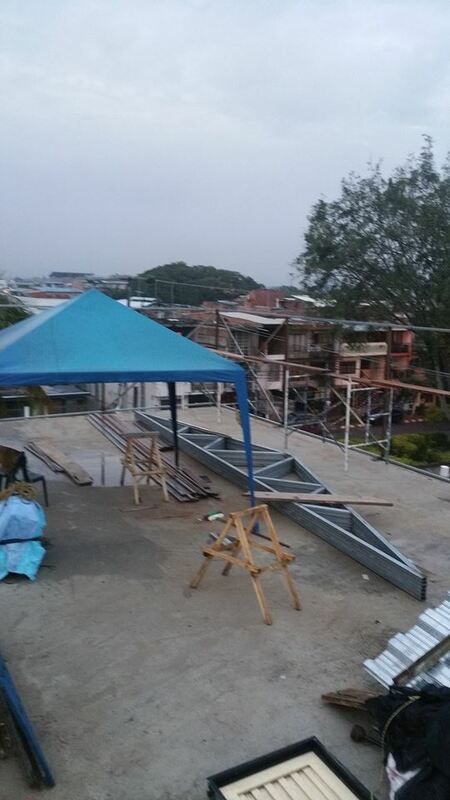 At which time, we’ll need a whole lot more money…..a the internal ‘fabric’ of the construction gets underway. When you think what this construction will achieve when it is complete, it’s astonishing: maybe another 150 kids or more looked after, in a place where they are so vulnerable to the early ‘assault’ of disreputable people who’d want them hooked on drugs as early in their lives as possible so they can be ‘used’ by the drug dealers sooner rather than later. We’ve been here 2 weeks now: it doesn’t seem possible, it’s gone so fast: just three more working days counting today (it’s 0755 am here as I write, 1355 UK time). Thanney was raring to go at 0600 this morning, and planning to work through, rain permitting, until 2000 this evening. 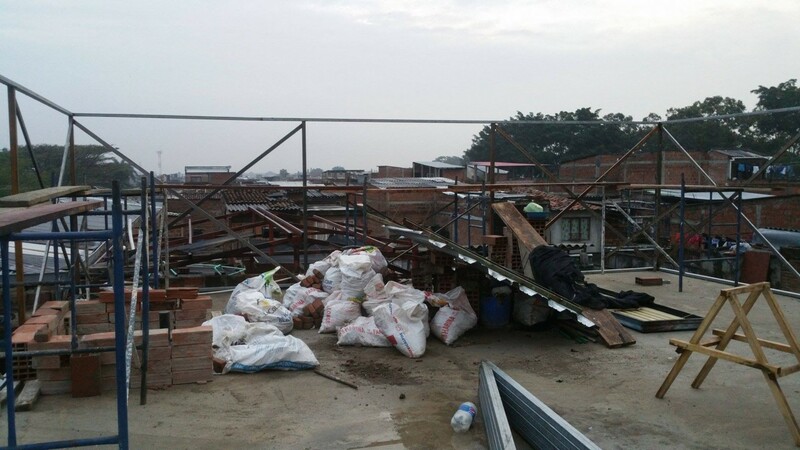 14 hours working on a roof in these temperatures is NO joke, but he – we – are committed to seeing this trip fulfil ALL we came for, both in respect of the Foundation, and the local churches. I’m covering the churches alone for the next few meetings, it seems, as Thanney needs to work: so the joy – but pressure, and incredible tiredness that personal ministry causes – are my responsibility. I’m glad though, that Thanney’s had great opportunity to see a good few miracles up until now: if he has a ‘supernaturally God-charged’ day today, and gets done everything he needs to, maybe it frees him up before Saturday to see God do some more through him. What he wants as his ‘legacy’ from this trip, is a roofed-walled enclosed building, ready for phase two in July…..and loads of miracled people!! Please pray over these next 3 days that God gives Thanney, and the people of the Mision El Abrigo church, who run the foundation, the desires of their hearts for this March sojourn in this wonderful city, and amazing country. When I pray for people for healing or a miracle, I look for a ‘deadline’ – a near-doctors appointment, a surgery date, a consultant visit…. deadlines are good, as there’s something ‘concrete’ to pin a healing ‘time-frame’ to: nothing nebulous and unknown vaguely somewhere in the future. 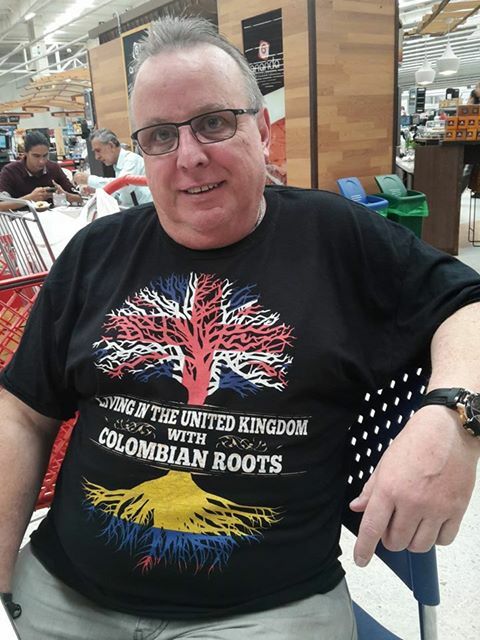 Here in Cali, Colombia – which I DO regard as a genuine home, spiritual and otherwise (Home is where your heart is, and all that! 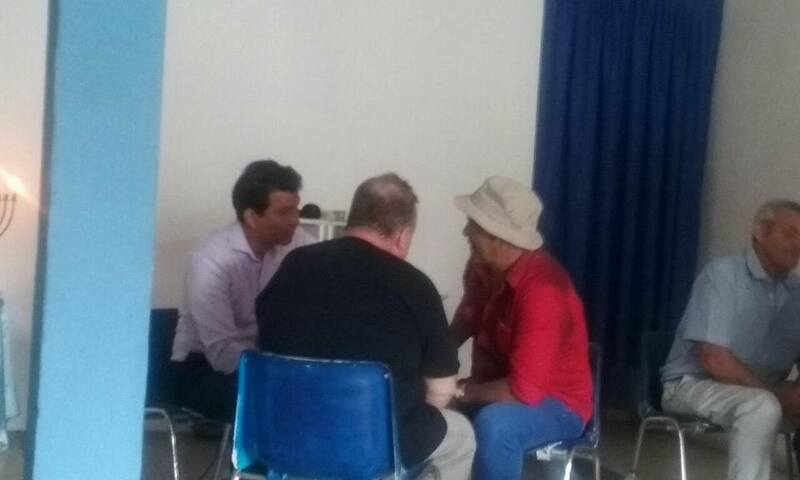 ), I’ve always been blessed to be ‘wanted’ back: 21 years coming to Colombia, 20 to Cali (this is my 79th time here), but this trip has seen a real acceleration in my being ‘honoured’ for being here, welcomed in many churches as ‘my home’, ‘part of our family in this church’ – which I have to say I find so incredibly humbling. I’ve been in tears many times this week. These are ‘key’ pastors in the move of God in this city and nation, and it totally blows me away…. Danny Silk, from Redding, California, wrote a wonderful book on ‘The Culture of Honour’: personally, I love to honour people, build them up, drop them into things they think they can’t do, run with them while they do it. Many years ago, my friends and mentors Clive and Ruth Calver did that for me in my early years of salvation and ministry, and it rubbed off on me (including my introduction to Indian food, with Clive: he started me OFF on a vindaloo…..). Honouring others is NOT just words: it’s a lifestyle, it releases incredible waves of God’s blessing and power into the person being honoured, so that THEY believe they can do what they couldn’t do – and do it. And it brings healing. And immense blessing to the ‘honourer’…..
By Tuesday, having thanked God every conceivable moment I could, for the prayers, affirmations, and the miracle that ‘I’d believed but had not yet received’, the change was dramatic. I COULD WALK!! I could bend my knees. I couldn’t quite keep up walking with Thanney, as he’s got long legs, and I have little trotters, but I wasn’t far behind. Yes, there’s still soreness: but it’s diminishing. Yes, the bones still crack, but a lot less, and nowhere near so excruciating. I’m ‘taking care’ of them – looking out for ‘unseen’ steps, dips in the pavement, taking stairs slowly – not step-step, though, both feet on one stair – I can do stairs like normal people right now! THANK YOU, LORD JESUS!! I want to declare it – rather than ‘give it a few weeks to see if I keep it’ – which I believe is the quickest to LOSE it. The man at the gate of the temple, in Acts 3, didn’t slink away quietly into the background, after his 38 years, saying, ‘Let’s give it a month, see if I can walk, leap, and dance then…. !’ – he took off. So thank you, Jesus, for this miracle I’m living in right now – still ongoing, but it IS just that – ongoing. I can actually SEE the shape of my kneecaps now – the swelling has begun to go down… might not sound much to you, but to be able to get out of a chair, stand up, and walk away – without using the chair to get up, standing still for about minute, to let the pain subside and get balance, and then hobbling away – is a joy!! I don’t plan on entering the London Marathon in a few weeks, not this year anyway…. but this is the answer to hundreds of my prayers, and countless of those of other people…. Thank you, thank you, Lord Jesus!!! A few days ago, I think I might have ‘obliterated’ what is, for me personally, one of the most significant blogs I’ve written in a long time…. with humour! ‘These days have been kneeded’…. Many of you are aware of the chronic condition that osteoarthritis has inflicted on my knees over the past 16 years or so. More orthopaedic surgeons and doctors than I can shake a stick at, have told me that I only have one course of action ahead – become titanium man, and have both knees surgically replaced. I’ve battled with that, as you can doubtless imagine, having prayed for literally hundreds, well into four figures in fact, of other people’s osteo-attacked knees, and seen just about all of them healed, mostly instantly: certainly all in the last four years, when mine have been at their worst, and I’ve been determined to shove the arthritis back in the enemy’s face on their behalf. Having experienced their pain on a daily basis, I don’t wish that pain on ANYONE. It really is excruciating. There have been days when I’ve sat in my living room at home, wanted something from the kitchen, all of 5 metres away, and thought, I can’t get up and get it yet…. I’ve battled, too, with the prospect of surgery: hips are pretty straight-forward, but knees have a significantly lower success rate, and I don’t know personally anyone who has had even one knee replaced, who is glad that they had it done. Let alone two knees. It’s also impossible to live alone, as I do, and have replacement knee surgery, especially in a house with steep, narrow stairs going to the (only) bathroom & loo, and bedroom…. For the past few years, I’ve heard surgeons tell me, ‘You shouldn’t even be able to stand up on those knees, let alone move’ – and other similar, really helpful comments! I’ve been determined that my life wouldn’t revolve around surgeon’s observations, and pain killers – heavy duty stuff the doc gives me, 8 a day of one, 2 of another: I’ve ‘survived’ generally on 2 of one, and 1 of the other…. and the quarterly cortisone/ steroid injections right into the knee (yes, it makes you squirm while you’re having it, too! – and it really IS the oddest sensation). Sometimes, those jabs work, normally for little more than a few weeks, maybe 6 if you’re lucky. Sometimes, as with the last ones I had back home in the UK, my knees were actually WORSE immediately after I’d had them. When I arrived here, I’d battled again (!) – two weeks….even as little as a few days …. before I flew to Colombia, I thought, I just can’t go, can’t do it. But I WANTED to be here: and I knew I HAD to be here, for Thanney, though I’m sure he could have looked after himself ;), but when the third member of what would have been our Irish trinity couldn’t come, I knew it was a must. I saw an orthopaedic doctor here 18 months ago, and he gave me cortisone injections – I’d have to say that they were among the best and long lasting that I’ve ever had. He also gave me anti-inflammatory injections to help the muscles. I pre-booked ahead of this trip, with another surgeon, for the day after I got here: more nice needles in the knee, and the anti-inflammatory injection I can buy over the counter in the pharmacy…. the injections didn’t really do anything, perhaps just took the extreme edge off the pain, which was both disappointing, and worrying for the rest of the trip. Preaching is something I just can’t do sitting down: and I’m the only preacher on this trip! Thanney was listening to my bones cracking even as I was standing still! BUT THEN……Wow – THANK YOU, GOD! And I’ll make this another blog post!! Today is the day of your miracle…. 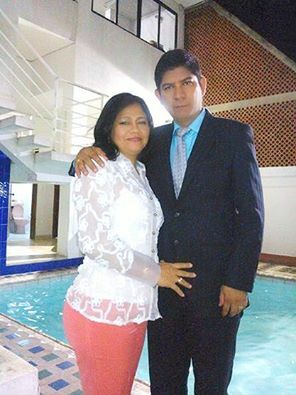 All I could come away with was the confimation of the pastor that, indeed, those things happened: but that both, for differing reasons, are now in other locations, churches – the lady, I think, in Bogota….. at least I have Pastor Alcides confirmation!! The church has also changed its name: it’s now Centro de Fe y Esperanza, La Sirena: Centre of Faith and Hope, La Sirena. 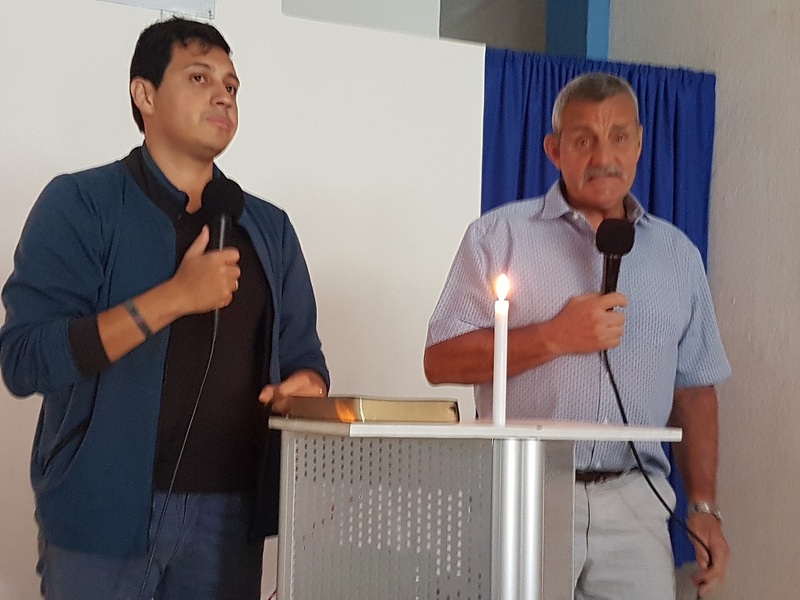 Pastor Alcides is another, this week, to publicly honour this little old Englishman: it was lovely to hear some of the things of he said, God really does seem to be ‘affirming’ the last 20 years here…. 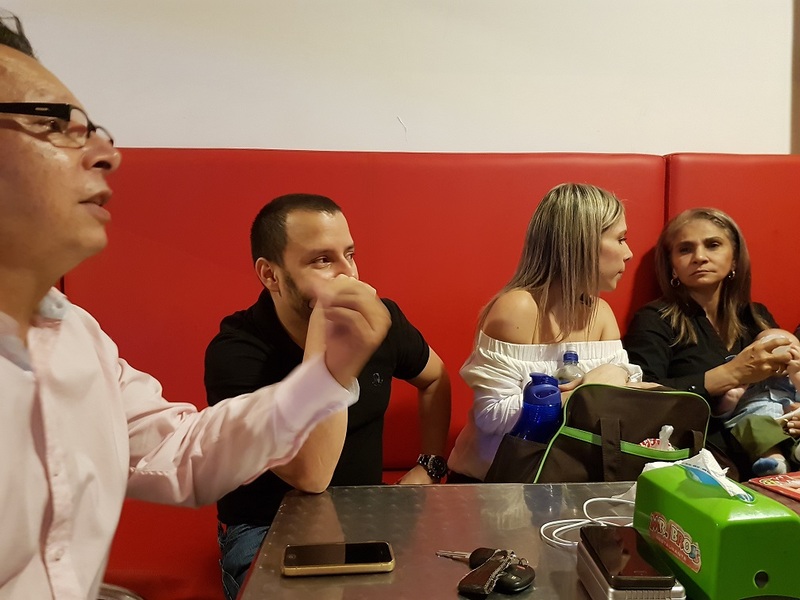 under strict instructions from Alcides and Leidy, his wife, to be back at the church NEXT time, not 2 or 3 years away… confirming all the miracles from the past, getting trstimonies from last night as they happened…. It was wonderful to Hein Hoere translate for me: Hein and Teija have been friends since day one for me in Cali, so we go back nearly 21 years now. 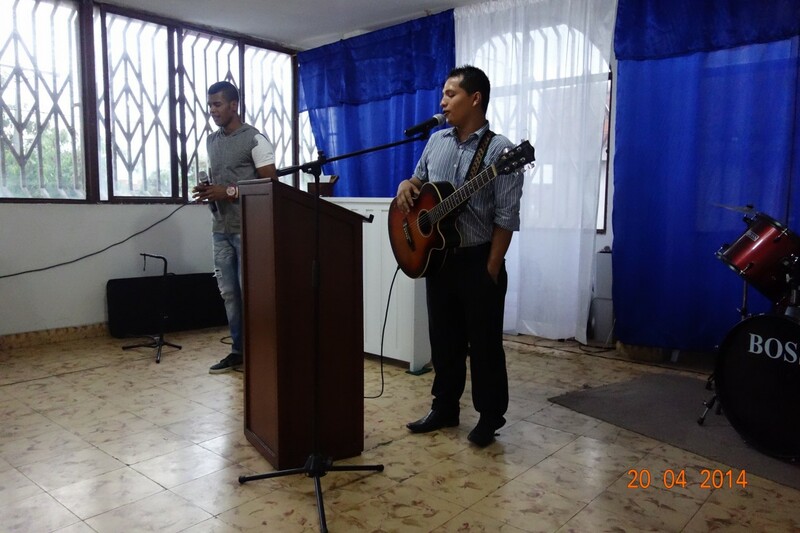 Hein’s a great preacher, teacher, musician, apostle, planting churches here, in Bolivia too…. and for me, it’s humbling to have someone who’s been a missionary here here, from Holland (Hein) and Finland (Teija) for more than 30 years, translate. The really are dear, dear friends. My great friend, Hein Hoere, long-time missionary to Cali, Colombia, and now Bolivia, translating for me last night. Thanney’s sensitive Irish ears loved the worship at the church! The room was about 15 feet square, with 4 big P.A. speakers, and an amplifier red-lining all the time! – it was just like Africa! Hein, Wilmar (both worship leaders and lovely sensitive ones at that) and I got to pray for the worship leader later: 30 years ago, in a nightmare, just after she’d been saved, apparently a lovely soprano voice that she’d already started using for God, when a ‘giant’ in her nightmare gripped her by her throat and told her it’d destroy her voice…. she had polyps on her larynx, and where the damage was done, too, there was a large gap between her vocl chords. So God bless her for keep worshipping and praising: and after last night, God – completely restore her voice, in Jesus’ Name! Thanney had a lovely miracle with a man who’d got big prostate problems: couldn’t pee, it was very swollen and uncomfortable for him in every way, including sitting down. Thanney prayed: the man went away. Then, a while later, he was back. The discomfort had gone, the pain had gone, and he’d peed…. THAT’S significant…. a real miracle, that possibly was, or could have become, life-threatening…. and this is Visitation sharing it with the Pastor, Alcides, and the church. Lots more besides…. I won’t list too many, as it probably gets tedious to read about God’s wonders…. 🙁 – and while I won’t say how sad I am, not many people are reading the blog the last few days….and it does take (surprisingly) quite a long time for a tech-idiot like me to put it together…. Another of the wonderful ‘regular’ churches that I am so blessed to keep having the chance to go back to here in Cali…. the Pastors, Diego and Candy, have become such good friends, and their daughter and son in law, Hanny & Carlos (and their delightful 5 month old son, Samuel, who I met last night for the time – he really IS gorgeous!) are dear friends and great fun. Hanny draws the short straw in that she gets to translate for me! It was, as always, a lovely meeting: but we got there an hour or more late, as the heavens opened with the – probably – most spectacular thunder and rainstorm we’ve seen so far, and we watched as lightning struck overhead power cables and made some interesting sparks (!! ), and took out the traffic lights…. Saturday evening on Cali’s roads with a river under the wheels, every car (it seemed) in the city out, and no traffic lights…. It’s wonderful the way churches keep worshipping until you get there! I can’t honestly ever see it happening at home in the UK, people would get bored, leave… and here, they don’t just sing, they REALLY worship. It continued for about another 20 minutes after we arrived, so we were able to get the ‘feel’ of the meeting…. 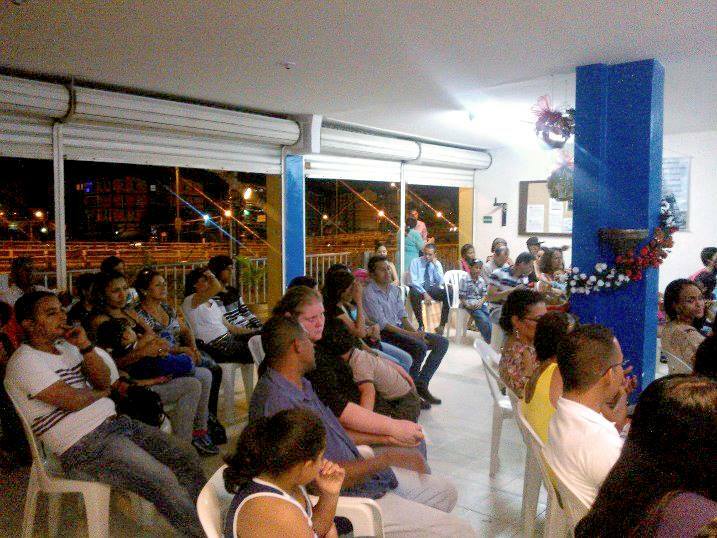 some years ago, I was due to preach in a satellite city of Cali, Jumbo: our driver that evening is true Colombian in his time keeping, and we got to the church 3½ hours late…. they were still worshipping! I have to say that the Pastor was a bit white, incendiary with rage(!! 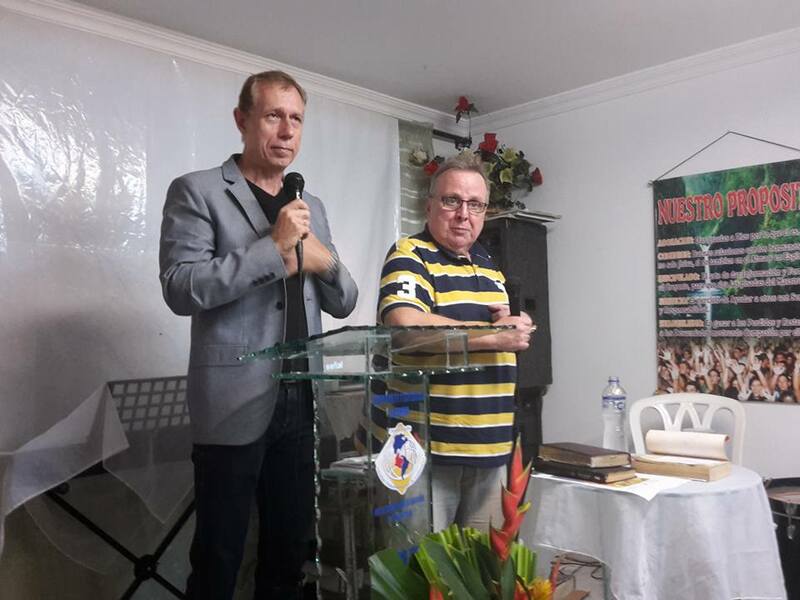 ), but God did some wonders that night, including beginning to bring feeling back to the paralysed body of a man from the church, who’d broken his spine in a motorbike accident 15 years earlier…. Healings? Yes, pain going, arthritis going, neck/shoulder pain – and all down the back – going. One lady, whose hands I held, had had a great pain in her hand exactly where I’d had my thumb: she hadn’t told me about it, but praying for financial provision for her, the pain went, apparently along with all the other pain in her body, which I also didn’t know about. A lot of the prayer for Thanney and me last night was to do with families, finance, relationships – all good, valid, worthwhile, but remarkably ‘unreportable’! There were people healed – to be totally honest, there’s NEVER a meeting where people aren’t healed…. it’s an open heaven, an amazing blessing from the Lord. Honorary Colombian? Necesito aprender mucho más español especialmente los verbos!